Joe Paterno firing: The Penn State Board of Trustees should not have to defend itself. 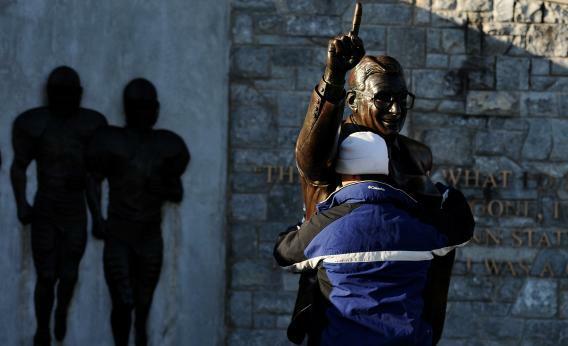 A fan pays respect to a statue of former Penn State football coach Joe Paterno before the Penn State against Nebraska football game at Beaver Stadium on November 12, 2011 in State College, Pennsylvania. Finally, a story out of Penn State that I can stand behind. In the New York Times today, several trustees of my alma mater speak out about their decision to fire longtime coach Joe Paterno following revelations about Jerry Sandusky’s alleged sexual abuse of children. Many alumni have been tarring and feathering the Penn State Board of Trustees for firing Paterno. There are campaigns to get the entire board removed; former Penn State player LaVar Arrington, now a Washington Redskin, wrote on the Washington Post earlier this week that “Paterno and the football program that he built have been offered up as a sacrificial lamb to the media and the public by those who should’ve made sure that this situation was handled properly.” Many of my fellow alumni have sworn not to donate to the school until the board has been replaced. laid out what they said were three key reasons for firing Paterno: his failure to do more when told about the suspected sexual assault in 2002; what they regarded as his questioning of the board’s authority in the days after Sandusky’s arrest; and what they determined to be his inability to effectively continue coaching in the face of continuing questions surrounding the program. To me, it wasn’t about guilt or innocence in a legal sense. … It was about these norms of society that I’m talking about: that every adult has a responsibility for every other child in our community. And that we have a responsibility not to do the minimum, the legal requirement. We have a responsibility for ensuring that we can take every effort that’s within our power not only to prevent further harm to that child, but to every other child. Since the scandal broke in November, I have been as dismayed as many outsiders by my fellow alumni’s reaction. Reports from three town hall meetings with alumni, held by the new university president, suggest that the focus was not the football program’s virtual license to operate with impunity, or how the university will change in the future to ensure that allegations of child sexual assault or other serious misconduct can will be given full, proper attention and investigations, though these topics were raised. Rather, alumni were still incensed by the perceived mistreatment of Paterno, with one woman tearing up at a New York town hall meeting while asking about the football coach. I’ve come to realize, though, that the Paterno fans are merely the loudest voices in this crowd. They have a lot of practice from football season. Many Penn Staters are instead being quiet, reflective, rather than trying in an absurd fashion to make Paterno into some sort of bizarre underdog in a match between him and the board.